The setting sun casts a gold light over the water as Khadjou Sambe and her student stare into the horizon, waiting patiently for the Atlantic ocean to offer up its next set of waves. Their surfboards gently knock against each other as Sambe leans towards the young girl and offers a soft spoken word of advice, before shouting ‘go!’. The two jump up onto their boards and seamlessly ride the awaited wave to shore. There was a time when a woman surfing these waves elicited a confused double-take at the very least. In the male-dominated world of surfing, Senegal had no female surfers until Sambe arrived on the scene. At 13 she took her first surfboard into the water. “I remember the first time I stood up on a board. I was so happy. I yelled so much that everyone looked at me,” says Sambe, now 23-years-old. Instantly hooked, the joy of surfing overshadowed the possible social complexities of being the only girl in the water. “When I surf I feel so happy. It’s like I am a dolphin who’s free to do what they want. Because you forget all the problems in your head. It’s like the sea belongs to you,” she says. Despite her instant love for surfing, Sambe admits there were plenty of challenges. In Senegal, the ocean had always tended to be male territory, traversed by fishermen while women waited on the shore to deal with the haul. While the relationship with the sea evolved to include other activities like surfing, the dynamic remained. The men in the water, women waiting along the coast. Khadjou was not one to obey the status quo. She pushed on forward as the only surfer girl in Senegal, “because when you love something you follow it through to the end,” she explains. And with this tenacious attitude, she paved the way for other women to experience the joy of surfing. 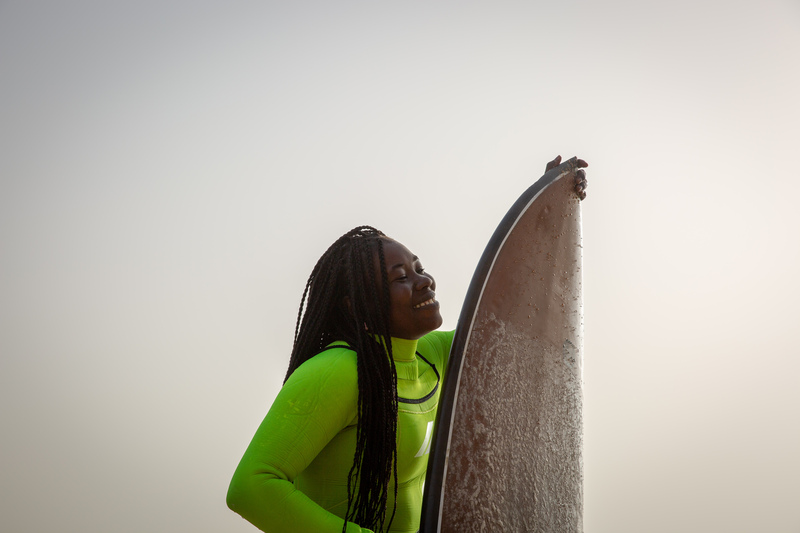 Ten years later, Sambe is no longer Senegal’s lone female surfer on Dakar’s peninsular. When we meet her on Dakar’s Les Almadies beach she is accompanied with two other friends; all three women donning t-shirts and caps with the slogan “Black Girls Surf.” They are preparing to go surfing and quickly change into their wetsuits before running down to the water, surfboards in tow. Their t-shirts reference the organisation Black Girls Surf (BSG), founded by Sambe’s surfing coach in America, Ronda Harper. Noticing a lack of visibility within professional surfing, Harper has made it her mission to support women like Sambe who aspire to surf professionally. “The image of the typical female surfer is blonde hair and blue eyes. For surf brands, the goal is to sell at any cost. Straying away from the stereotype has been the biggest hurdle. You can’t get sponsored if you don’t fit the image,” Harper says. “Our goal is to recruit girls around the world for our training program. I founded BGS out of need,” she adds. Last year, Sambe spent six months training with Harper, with qualification for Tokyo’s 2020 Olympics at the top on her agenda. And while she set her sights high, she has no plans to leave her female counterparts behind. 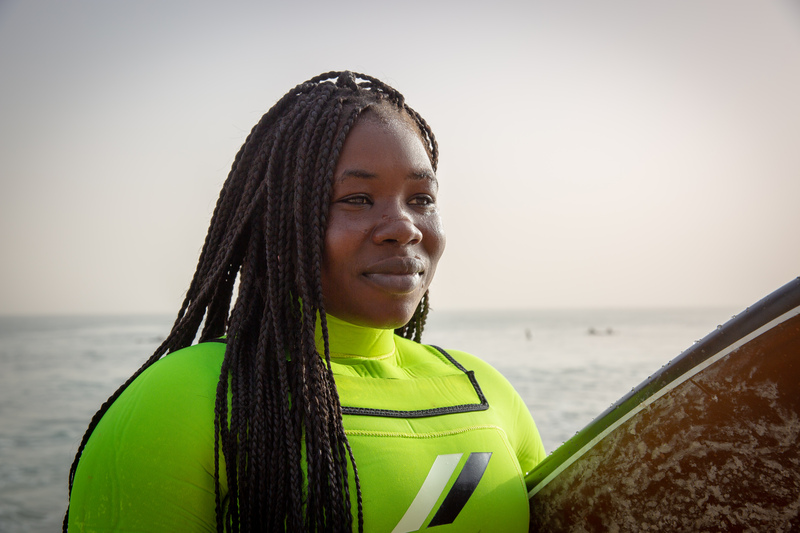 Now back in her hometown, Sambe passes her mentor’s lessons forward, and is now training girls in Senegal to surf. Sambe’s unwavering spirit appears to be paying off as more and more women and girls pick up their boards and take to the waves in Dakar. With each new student, she challenges the patriarchal world of surfing and shows women will no longer simply wait along the coast. Interview with Khadjou Sambe was translated from French into English by Asta Tall.